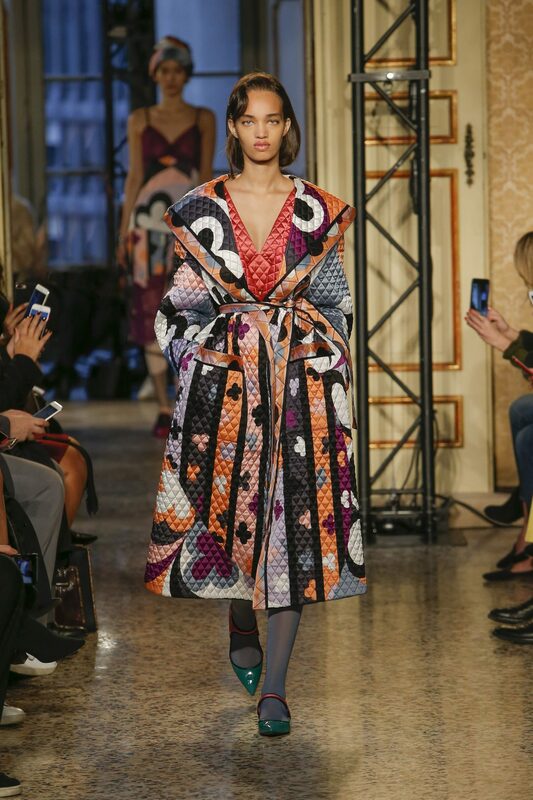 Emilio Pucci’s own ties with America – The unique silhouette style, curvaceous, elongated and dynamic. The jet set aura and the sporty spirit are mixed and glamorously mingled. Emilio Pucci’s own ties with America, his love for sportswear and a ground breaking lingerie deal dating back to the Fifties, inspire a glitzy detour across ideas of femininity. The unique silhouette style comes in two forms, a shapely and curvaceous style or an elongated and dynamic one, with voluminous duvets, roomy melton duffels and luit xuriously utilitarian double-face coats offering function and protection. Marylin Monroe’s archetypal charm. Cropped knits tops further highlight the womanly shapes. Quilting is a cozy mountain touch that runs up to the toque hats, gaining a sophisticated flair. The private becomes public, the alluring and the sporty, continuously mixed: silk jersey pieces and lace details. Pucci solids on long silk jersey can be seen on dresses that were favoured by Marilyn Monroe. Sophistication meets function in the accessories line: minimal leather shopping bags, both in print and solids, with plexiglass handles; over-sized pockets go from skirts to bags. Is the Brexit sun setting on British PM?